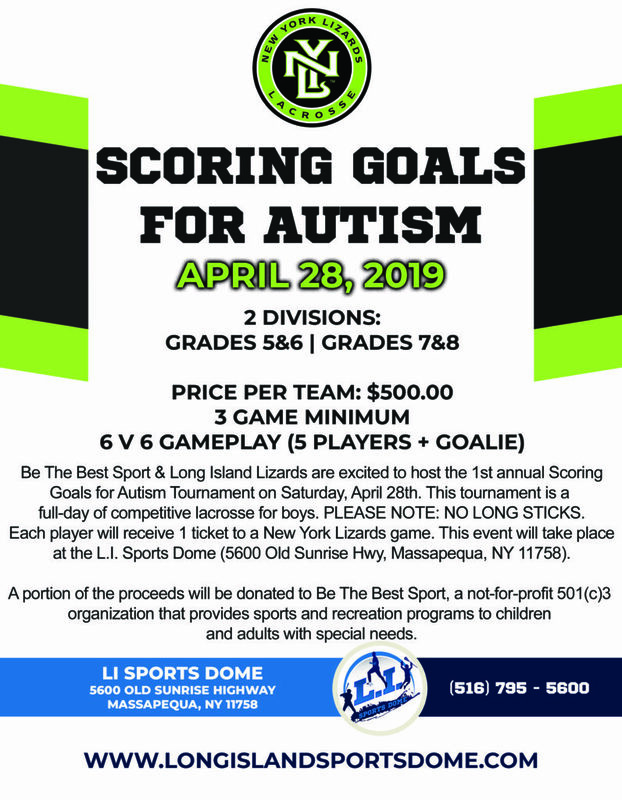 Be The Best Sport & Long Island Lizards are excited to host the 1st annual Scoring Goals for Autism Tournament on Saturday, April 28th. This tournament is a full-day of competitive lacrosse for boys. PLEASE NOTE: NO LONG STICKS. Each player will receive 1 ticket to a New York Lizards game. This event will take place at the L.I. Sports Dome (5600 Old Sunrise Hwy, Massapequa, NY 11758). A portion of the proceeds will be donated to Be The Best Sport, a not-for-profit 501(c)3 organization that provides sports and recreation programs to children and adults with special needs.